I am often a bit reticent to partake in particularly (over)hyped skincare and makeup products for fear that they will fall short of my expectations, and leave me disappointed (and with fewer coins to use on tried and true products, or those that fall into the ever expanding category of "calculated risks"). Rodin Olio Lusso products certainly have a devoted fan-base who wouldn't even consider defecting to another line despite the exorbitant price tag ($150.00 for a single ounce of the luxury face oil). Such devotees freely extol the virtues of this product and would no more be inclined to use another face oil than they would be to put sugar in their own gas tanks. So with this knowledge in mind, I decided to first try a sample before committing to the full-sized bottle. I have long used facial oils, therefore this particular face oil required no paradigm shift for me to contemplate its use. However, I wasn't sure how I would feel about putting the gloriously scented blend of 11 natural oils all over my face because I was unaccustomed to the notion of using natural Jasmine oil as anything other than a fragrance for my body, rather than as a treatment for my face. I feared that it might wreak havoc on my combination skin because Jasmine Oil is the first ingredient on the list. However, not only was I wrong about that, but I actually found the scent to be calming, intoxicatingly delicious, and unmistakably luxurious. In fact, among the properties of Jasmine Oil it is purported to reduce scarring, tone the skin, lift the spirits, and effectively treat dry skin. This liquid gold elixir sinks in faster than any oil that I have used to date, and it not only imparts the skin with an unprecedented healthy glow, but it likewise hydrates and moisturizes the skin better than I have ever imagined possible. When I apply this at night I wake up with a glow that I have to date never experienced. It also sinks in so quickly that there is no need to sit and wait for it to be absorbed before applying makeup. Additionally, a drop of this in your foundation or tinted moisturizer will give you the most amazing finish imaginable. While you are quite rational to raise an eyebrow at the price, I would argue that it is worth every last cent. That it offers an unbelievably sensual tactile and sensory experience would have been enough cause to squeal with glee, but it is also very concentrated making a one ounce bottle stretch quite a bit further than one might imagine possible. I only use about 2-3 small drops for my entire face, neck and décolletage- thereby making this bottle far more economical than it appears at first blush. 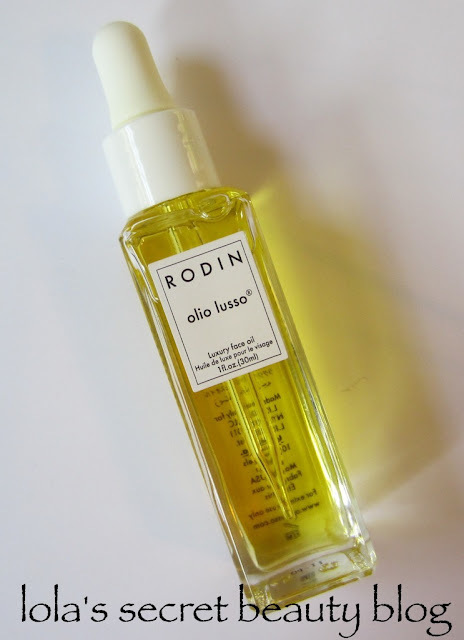 According to Rodin, Olio Lusso Luxury Face Oil, which was created by New York fashion stylist Linda Rodin, was nearly two years in the making. 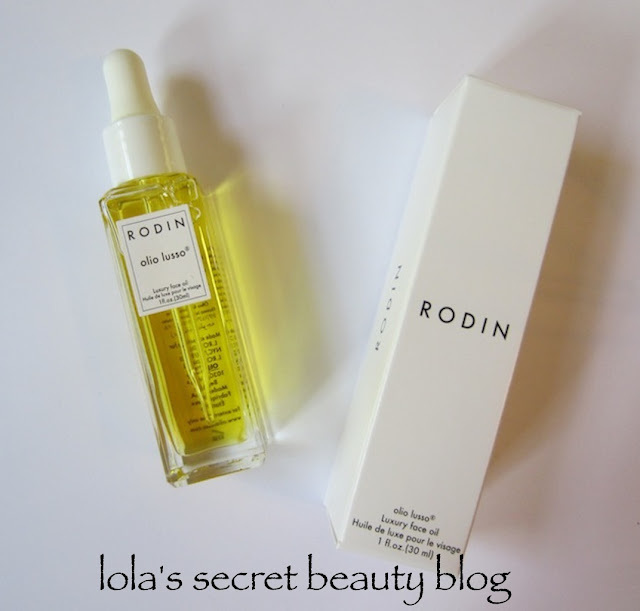 Rodin created this luxury oil to, "satisfy all her complexion-beauty needs. The result: a perfect potion that is nothing short of amazing! No wonder it’s created a non-stop buzz in the beauty and skincare worlds. Packed with eleven essential oils derived from flowers and other botanicals, this is the ideal liquid moisturizer for anyone seeking a simple solution to hydrated skin and a luminous, light-reflecting complexion. Like magic, it effortlessly melts into complexions that are 'normal,' oily, dry, or any combination thereof, without leaving any greasy residue." No wild claims are made that this ultra luxe oil will immediately eradicate the ravages of time, or that it is the ultimate fountain of youth culled from a newly discovered region in some far off exotic land, or that it will immediately make you appear 10 -20 years younger. This magical elixir won't make your beloved clean up after him/herself, or do your laundry for you, but it will offer you one of the most enjoyable experiences of self-pampering, and it will make your skin look fantastic. My skin looks clear, bright, rested (even when I am not), even-toned, moisturized, utterly hydrated, and deliciously glowing (not greasy, but lit from within and healthy). This delectable luxury oil is so precious to so many that it made it to Allure Magazine's coveted October 2012 Best of Beauty: Top Splurges list- which comes as no surprise to me! Directions: Apply a few precious drops on a moist, freshly washed face and neck, morning and night. Follow with makeup—or not. Either way, RODIN olio lusso luxury face oil will leave a naturally healthy sheen. Applied morning and night, olio lusso is perfect for anyone seeking hydrated skin, and a luminous complexion. Store bottle out of direct sunlight. Overall assessment: It's pretty much mad love for me. I also find myself particularly compelled by Linda Rodin herself (watch the video and see why for yourself). I have a pronounced sense of wellbeing when I use this oil-- which makes me crave using it all the more. I actually didn't expect to react to this oil as I have, but I have to say that there really is something that sets this oil apart from the many luxury oils that have recently flooded the market. Of course if you have an aversion to the smell, or worse yet are allergic to any of the ingredients-- then you will not find this to be golden liquid love as I do. However, if you are like me- then open the door and say hello to luxury face oil nirvana-- this is pure magic. UPDATE 10/13/12: Since I wrote this article, something happened that further deepened my resolve that this is the greatest face oil ever invented. I had two very small dry patches on my face (one on my nose and one on my chin), and for whatever reason none of the oils, creams or exfoliants ever adequately addressed the issue- let alone did anything to heal the skin. I had actually given up on trying to find a magic potion to fix the problem, and didn't want to use some sort of prescription chemical compound to treat something that didn't warrant such drastic measures. However, one day after using Olio Lusso for a while, I noticed that both spots were no longer dry. In fact, they looked soft, hydrated and glowing. I stopped looking for a magical elixir to heal my woes, and just when I had given up- it found me. I am in awe of this product, and after this experience I categorically deem it the best of the best. 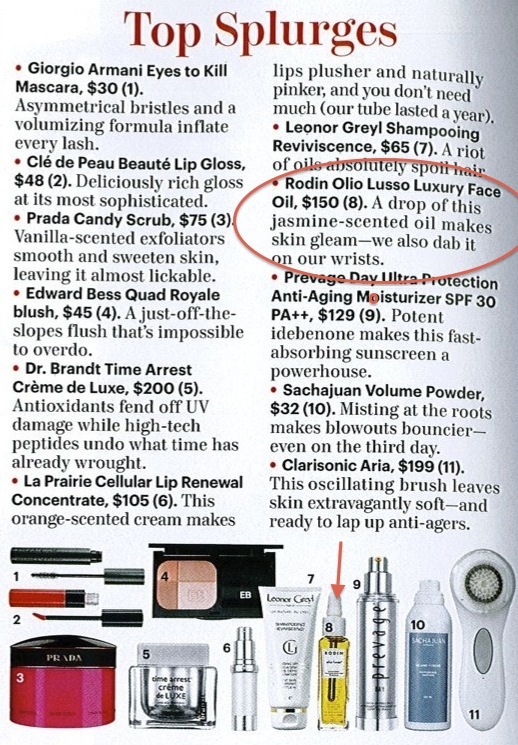 Allure Magazine, in their infinite wisdom, selected the perfect face oil for their Best of Beauty Top Splurges category. In my opinion, this really is as good as it gets! It is definitely hands down the best luxury face oil that I have tried to date, and by a long shot at that! $170.00 1 fl. oz. Available from Barneys New York, Beautyhabit, Dermstore & B-Glowing (Affiliate links). How would you rank all the facial oils you've used? 1-5 or 1-10, depending on how many you've used? I've only used 3 myself, Bobbi Brown's, Clarins for dehydrated skin, and Juno by Sunday Riley. I would give the edge to Juno and part of the reason is the packaging. I prefer the more hygienic pump. Bobbi's is an open pour, so thumbs down for that. Little heavy, as is Clarins, on a patchouli scent. I actually love the herbal scent of Juno, which also absorbs more quickly into the skin. So of the three I've tried, I'd go 1 Juno, 2 Clarins, and 3 Bobbi Brown. Can't wait to try Rodin once my Juno runs out, although your review of Ladi Avocanto has me interested as well. Hence, the request for you to rank the oils based on your personal preference. Thank you so much for stopping by and taking the time to leave such a great comment! I have used a great many oils over time-- long ago I tried the Clarins oils (I liked them, but it is far too long ago to leave a meaningful assessment since my impressions are based upon memory), I also tried the Bobbi Brown Oil (also too long ago to leave a meaningful assessment). More recently I used both of the face oils from Suki (the one for drier skin as well as the one for combination skin)- they are both fantastic, but I no longer have them in my stash- so I can't effectively compare them to the ones that I currently have. My stash currently includes Juno Oil (which I have used for about 4+ years), Ladi Avokanto, and Olio Lusso. I think that all three are fantastic, but I think that Olio Lusso is a cut above the other two. I find that it absorbs faster, hydrates more deeply, and makes my skin look more radiant than the other two. I also made the shocking discovery that the two small dry patches that I had on my face (one on my nose and one on my chin) have completely disappeared after using Olio Lusso whereas neither Juno or Ladi did anything to get rid of them AT ALL-- this alone has put Olio Lusso at the top of my list. I have also noticed that fine lines have plumped up and my skin just looks ridiculously happy, glowing and hydrated. I think that I would say that the improvements are far more pronounced with Olio Lusso. My second favorite oil would probably be Ladi Avokanto-- because it does everything for my skin that Juno does, but it sinks in faster and is less expensive. I still love Juno, and unlike the many people who complain about the smell-- I have always loved it. That said, in the category of smell-- Olio Lusso wins hands down! I find the Jasmine unbelievably pleasant and calming, and I suspect that it might just be the ingredient that effectively eradicated my two dry patches- since it is supposed to do wonders for dry skin. All I can say is that in a short period of time Olio Lusso has made a shocking and marked difference in my skin-- and it has been very evident to others as well., While I think that other two oils are wonderful, I think that Olio Lusso is heavenly. This is one hyped product the is probably understated when one considers just how effective it actually is! I'm still pretty shocked by the difference. I would definitely see if you can get your hands on samples of all three to see if your experience is similar to mine. I can tell you right now-- as soon as I finish Olio Lusso I will buy another bottle-- I do not want to ever be without it!! Keep me posted!! I am really interested to see which one you like the best!! You make this oil seem so delectable. If I only I had A spare £100! I love using facial oils, they make such a difference to the skin, especially in cold weathers! I am a convert to Olio Lusso too. Everything else is second rate. I go through 2.5 bottles a year- I know it's expensive but my skin is beautiful since I've switched and I will never go back to anything else. I only use olio lusso 3 drops in my makeup every morning and a couple of drops before bed. Everyone tells me I have gorgeous skin. It glows and I save tons of money not wasting my time with lower priced products. (FYI- my skin was not this beautiful in my younger year- acne, dry patches etc.) I don't use a moisturizer and most estheticians gasp when they hear I'm 46. I have obviously hit the right product because I don't have wrinkles and I feel like the oil has an overall healing effect on my skin. Hi Rose, I am so happy to hear that you have, and love, Olio Lusso! I actually just bought another bottle two days ago, and it remains one of my all-time favorite face oils. It really sounds as though it is a perfect fit for your skin! Hey there .. I've seen what is on this oil.. lol. when you buy all it cost ... like 2 times cheaper. And re-usable with more product !!! Hi there, yes of course one could buy all of the individual oils and make their own version of this, but it might not be quite so easy to determine the amounts and grades of each one. 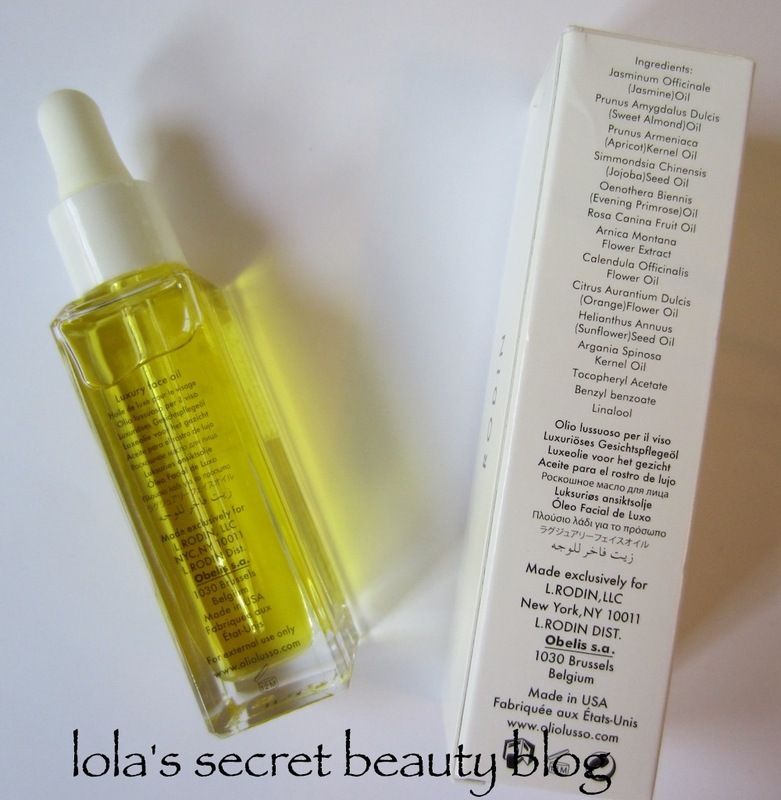 I love what Olio Lusso has done for my skin, and think that it is a phenomenal oil! Is this better than the Morroccan oil? I have heard lots of positive reviews about it too so I got confused when I have also read your review regarding this. Hi Annie, I don't have Moroccan Oil so I couldn't compare them. Isn't Moroccan Oil generally used for the hair? This Olio Lusso oil is for the face, not the hair. It is a very lovely face oil though!! Saw this post pop up in my feed during a quick browse and I was so scared to read it in case you made me fall in love with it! And you have. :) I'll have to scope out a tester somewhere and start saving my money!!! Oh Liz-- Olio Lusso is pure magic!! Try to get a sample, if possible-- it really is unbelievably luxurious. It makes me feel great, my skin looks wonderful, and it just makes me happy-- I have never had skincare product give me an instant sense of wellbeing like this does!! It's pretty magical for me! Which oil would you recommend for skin that is combination and acne prone? I also have hyper pigmentation. Hi there! Thanks for stopping by! The best face oil that i have tried that is specifically formulated for combination/oily/acne prone skin is Suki Pure Facial Moisture Balancing. I have combination skin and used it for years. It really kept my oil production in check. I really love the entire line. They also offer free samples when you place orders directly through their website. It's a lovely company, and the products are lovely. This is a really lovely oil, but I would try to get samples to make sure that it doesn't trigger a break-out. Also you might want to try a sample of Olio Lusso to see how your skin responds to it as well. My skin is decidedly combination- though I am not acne prone (I do get periodic break-outs though), and neither the Sponge nor the Rodin oils have ever caused me to break out. I have a couple of friends who have acne prone skin who have kept away from face oils altogether because they are afraid of what will happen. My thought is to get samples and patch test in a discrete spot on your face to see whether it triggers a break-out. Of the three oils, the one by Suki is the only one specifically formulated for combination, acne prone skin- so it might be a good place to start.